Whilst the rôle of honourable men and true amongst the local preachers of our Connexion is being called, we claim a place for Mr. James Simpson, of Smallbridge, the oldest local preacher upon the Littleborough Circuit, and none more worthy. His name is well known and honoured by most of the elder ministers of the Manchester District. He is now seventy-one years of age, being born in a village named Wardle in the year 1833. Wardle is two and a half miles from Rochdale, and described by Waugh, in his “sketches of Lancashire,” as very rough ground in former days. A place through which respectably-dressed people need not hope to pass without insult and even jostling. And whilst it would be impossible to credit the stories told about the wiseacres of Wardle, yet there still remain traces of superstitions which have died slowly. They are bordering the hill country, and emphasise all the peculiarities of the hill people. The early surroundings of our brother were not of the most helpful character, nor were his social advantages great, his parents being poor. At an early age he was sent to work in the mill, but the influence of a pious mother proved his greatest earthly heritage. In the year 1851 Revival Services were conducted at our chapel at Smallbridge (near to Wardle) by the Rev. George Kidd, then Superintendent of the Rochdale. Circuit during which a number of young people were brought to Christ, amongst whom was Brother Simpson, then in his 19th year. Such rapid progress did he make in spiritual life that in the following year he received from the Rev. T. Jobling a note authorising him to accompany a brother to his appointments, with the view of his becoming a local preacher. And for over half a century he has filled that position with great acceptance to the churches and credit to himself. He early discovered that the work to which he had been called demanded self-discipline and mental culture, to which he set himself determinedly. As a local preacher, we may safely state (without prejudice to others) that he holds the premier position in this locality. He is much sought after by other churches, though nowhere is he more popular than upon his own Circuit, and few indeed are the Sundays which he allows himself for rest. In the years 1876-7 he served with great satisfaction and success as hired local preacher on the Woodley Circuit under the superintendency of the late Rev. Walter Graham, and their mutual respect continued until death intervened. Brother Simpson is one of the most thorough men whom I have met. His conscientious preparation for the pulpit, his constant desire to strike out new paths of thought, his shrinking from trotting out old sermons, give a beautiful freshness, and strength to all his public efforts. A man of great natural ability, his keen analytical mind, combined with his strong homiletical tastes, make him supremely a preacher, and preaching is his delight – his only hobby, his strongest passion; his thought is anchored to it, his reading focuses upon it. He has been a wide reader from his youth up. From his early grounding in “Cook’s Theology,” and his grip of much of Dr. Adam Clarke, he has made himself familiar with most of the works of Prof. Henry Drummond, Archdeacon Farrar, Henry Ward Beecher. But I fancy that his model and ideal was Dr. Joseph Parker, he being the authority he most frequently quotes. But he says that he is rather too old to find common ground with some of the younger leaders of pulpit thought, such as Dr. Parker’s successor. The theological and sermonic department of the Rochdale Free Library is well used by our friend. He has shrank from official position, though he has had to carry his share of it; but he has persistently refused to represent his Circuit in District Meeting, yet seldom does one pass without his presence at some part, but here the sermons and speeches are the attraction. Our friend has not escaped “ the trial of his faith, which is more precious than of gold which perisheth.” And so he speaks with the authority of a man who can say: “I know him whom I have believed.” Nor has he escaped the ministry of suffering. Six years ago he sustained a severe blow through the death of his beloved wife, after a long and painful illness, borne with Christian fortitude. 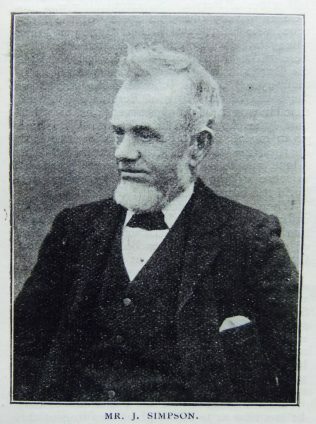 James was born in 1833 to parents Edmund and Christiana. Edmund was a woollen spinner. James married Mary Ann Penrith (abt1831-1898) in late 1854 in the Rochdale, Registration District. Census returns identify five children. James died before the 1911 census.